Do yourself a favor and get a subscription to German Architectural Digest. It's by far one of our favorite shelter magazines and they always have the most stunning interiors. Something about it seems much fresher than the American version and although we can't read a lick of it, we always find the imagery very inspiring. This particular issue covered the sleek designs of Shelton Mindel who we must say, never ceases to amaze us. ***UPDATE*** As you may have heard by now-we got it wrong! Guess we can cross "Explore Fortune Telling" off our bucket list. A BIG congratulations to Margaret Russell. Very well deserved and we look forward to seeing where she goes with it. What a scoop! I hope it is true as I lived in Switzerland for 7 years and enjoyed every issue of AD Deutschland. I am also a faithful reader of the Spanish edition and find it much more diverse and up-to-date than the American magazine. The articles tend to assume that the reader has a higher than average knowledge of design and thus provide more in depth coverage. Hopefully, American AD will start to do the same. I also recommend AD Spain - It has its own direction and they always have something unique to look at. Fantastic news, thanks for the scoop! Interesting insight...looking forward to the final annoucement about our AD! 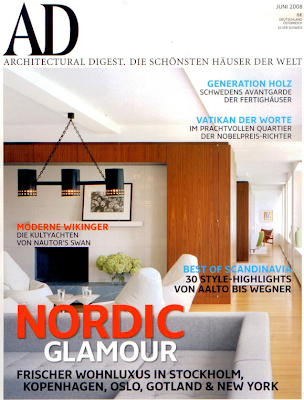 And love the Nordic feature on the German cover...as a Norwegian American interior designer I am always a fan of good Scandinavian anything! margit mayer, the editor in chief of german AD, is an enormous talent and a style icon. americans need someone like her to reshape their tired and bland AD. margaret russell would be a foolish choice. I love your work!!!! Check out my blog about you today. yes, i haven't bought an american AD in years but regularly get the german and the spanish issues... they're fantastic!! That would be fantastic because US AD is DREADFUL! Vulgar, crass, overblown; it's hard to think of all the pejorative terms I'd use to describe Architectural Digest in the US. I have picked up a few Deutsche ADs over the years but given up because I don't speak German. Crossing my fingers, hoping it's true! We really need a new modern design mag now that Metropolitan Home closed.